“The last time we saw anything similar was two years ago on the Fourth of July,” Navy Capt. Jeff Davis, a Norad spokesman, told the Free Beacon. The Tu-95 is a long-range strike aircraft capable of carrying nuclear cruise missiles. Other versions are equipped with intelligence-gathering sensors and electronic warfare gear. It has a range of around 9,400 miles without refueling. Davis said the aircraft “acted professionally” and the bombers appeared to be conducting a training mission. The Alaska-California bombers flight also came a month after a Russian Su-27 interceptor jet flew dangerously close to a U.S. RC-135 reconnaissance aircraft flying over the Sea of Okhotsk, north of Japan. In that incident on April 23, the Su-27 jet flew close to the RC-135, turned to reveal its air-to-air missiles to the crew, and then flew dangerously close to within 100 feet of the cockpit in a maneuver military officials called reckless. Davis said in the past 10 years, 50 Bear H bombers were intercepted near U.S. air defense zone, although he acknowledged that Monday’s flight near California was unusual. In April, a telephone conversation between two Russian ambassadors was posted on YouTube and appeared to show the diplomats joking about the Ukraine crisis and discussing the possible incursions in the United States and Eastern Europe. Russian Bear H flights elsewhere have increased in recent years. In February 2013, two of the bombers were intercepted as they circled the U.S. Pacific island of Guam, in a rare long-range incursion. Two Bear Hs also were intercepted near Alaska on April 28, 2013. 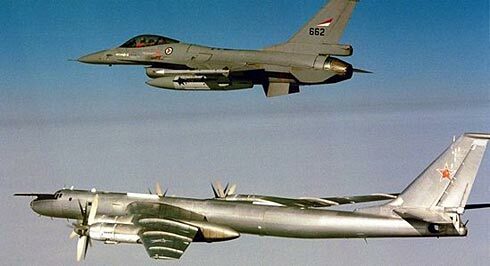 A Russian Bear H incursion in Asia took place in in July 2013 when two Tu-95s were intercepted by Japanese and South Korean jets near the Korean peninsula and Japan’s northern Hokkaido Island. The July 4, 2012, bomber flights near the West Coast were the first time since the Cold War that Russian jets has traveled so close to the U.S. coastline. That action followed an earlier intrusion by Tu-95s near Alaska that were part of large-scale strategic nuclear exercises by the Russians aimed at practicing strikes on enemy air defenses. Russia has stepped up provocative nuclear war games in recent years as part of propaganda efforts to display Moscow’s dislike of U.S. missile defenses in Europe.